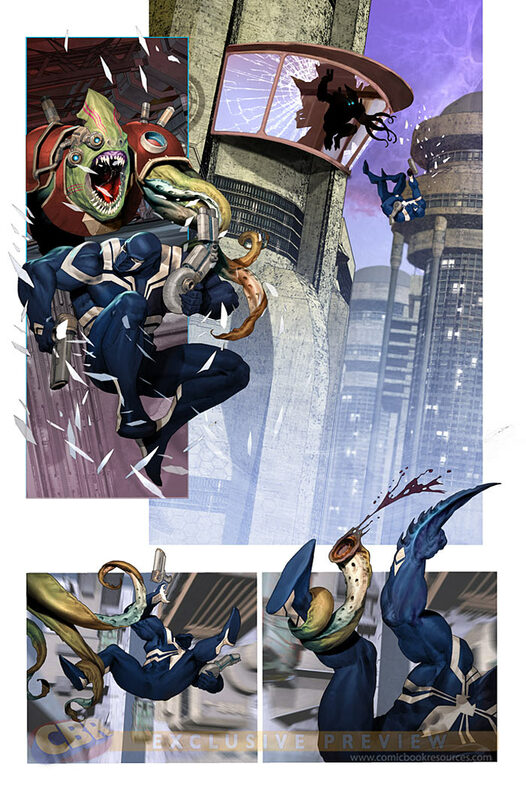 Flash's Guardians membership led him and Venom to the symbiote's home planet where they discovered Venom's people were a race called the Klyntar -- and that they had big plans for both Flash and his suit. That encounter resulted in what appeared to be a physical and psychological cleansing for Flash and Venom, and now the symbiotic pair are ready to be what the Klyntar originally hoped they could be: cosmic agents of justice. Flash and his Klyntar friend will set out on that path this November in "Venom: Space Knight," a new "All-New, All-Different Marvel" ongoing series by "Silk" and "Supernatural" writer Robbie Thompson and artist Ariel Olivetti. CBR News spoke with Thompson about Flash's solo adventures, what role the Guardians and other familiar Marvel Cosmic faces might play in those exploits and the series' connection to the fabled Space Knights of Galador. CBR News: Robbie, with "Venom: Space Knight" you're picking up the adventures of "Guardians of the Galaxy" member Eugene "Flash" Thompson AKA Agent Venom. It seems like this would be an especially fun assignment to you since it combines the Spider-Man family with the cosmic adventures of characters you love like the Fantastic Four, correct? Robbie Thompson: Yeah, when I heard about this book I was actually at breakfast with my editor Nick Lowe and ["Amazing Spider-Man"] Dan Slott. The book came up in passing and later I reached out to Nick and said, "Boy, that book sounds pretty awesome. I don't know if you have a writer attached, but I'd love to pitch for it." Nick was kind enough to pass along my name to editor Jake Thomas. Jake reached out and was like, "Hey, would you like to pitch on this book?" [Laughs] I was like, "Yes! Please, let me pitch on this book!" So he told me a little bit more about what they were looking for and I got even more excited. You used a key word in your question, "fun." This book is fun. It's been so much fun to write, it's so much fun to work with Ariel [Olivetti], and it's so much fun to work with Jake. So, yeah, it's a blast to be in the Spider-Man family, and yet we're heading off to some crazy planets and visiting with some crazy aliens, all while keeping the core of the book about Flash Thompson and his new life with his Klyntar friend. Which aspects of Flash do you find especially interesting? Which facets of his personality do you really want to explore in this title? Obviously I love Flash's last name. I think it's a very strong, dynamic, yet sensitive name. [Laughs] Flash is actually one of my long time favorite Marvel characters and not just because of his last name. The thing I love about him is that he's been around in the Marvel Universe for a long time, and he's grown as a character throughout the years. He started as a bully who picked on Peter Parker. He became enamored with Spider-Man, as I think we all do, because it's easy to relate to him. Then he sort of saw the error of his bullying ways. He grew up in a really tough household and had a really tough childhood. He became a member of the U.S. Armed Forces, and became a war hero. There's a great personal reason why he became a bully. There's a great personal reason why he's struggled with his alcoholism. And those are the things that I love most about Flash; the fact that he's a very real, classic Marvel character. He's very relatable. So I love the fact that he's grown as a character, and that he's also flawed. Yet through it all he has this inner strength. He has a desire to be a hero and the really great thing that came out of Brian Michael Bendis' "Planet of the Symbiotes" arc in "Guardians of the Galaxy" was this is a second chance for the Klyntar because it got cleansed, but it's also a second chance for Flash. That's the thing we're really burrowing into. 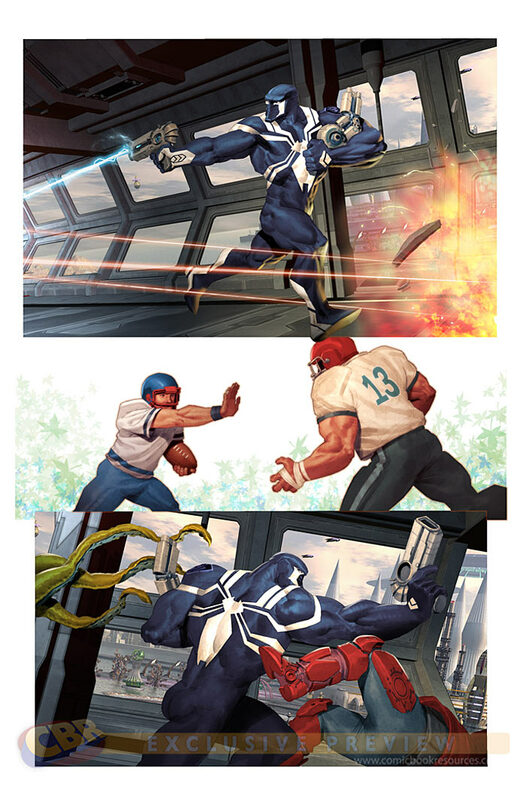 He's had a tough run for many years, and he's had a tough run as Venom. 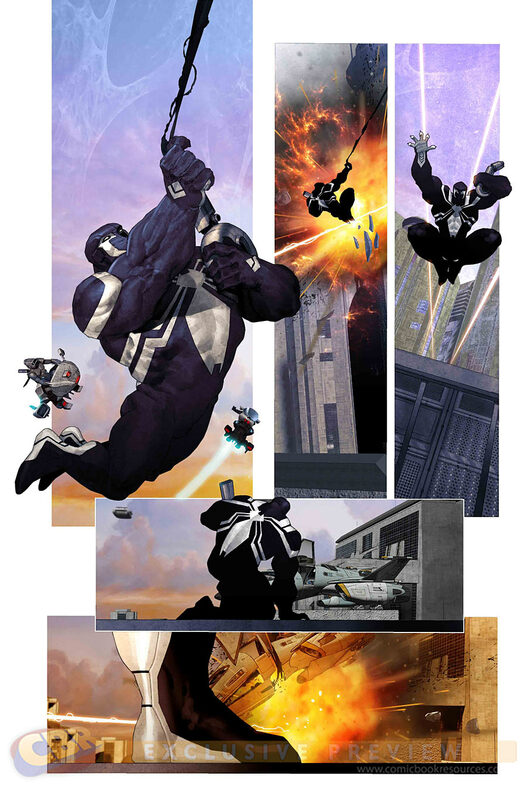 The Rick Remender and Cullen Bunn "Venom" issues are fantastic. They're so awesome, but both Flash and Venom take a beating in them. [Laughs] So in joining the Guardians of the Galaxy and going on these solo adventures, it's an opportunity for both Flash and the Klyntar to define themselves by their current actions rather than their past. They're both kind of boldly going, if you will, into these solo adventures with -- I don't want to say a clean slate, because we're not in any way shape or form ignoring their history, and we can't because they both have these things inside them that they have to guard against -- but there is an opportunity here for them to be heroes. When Ariel sent out that first image, he so instantly captured the feeling and tone of the book. That's what we're going to be going for each issue, fun, heroic space adventure! As the book goes on it's becoming a buddy cop movie, but with just one person. [Laughs] Nice. Does the title "Space Knight" refer to the fact that Flash is sort of a cosmic knight errant in a living suit of armor? Or does he actually have an affiliation with some of the survivors of Galador, the home planet of the Space Knights? With regards to the Space Knights, we're not exactly doing the Galador Space Knights, but there's a sort of idea there we're going to be getting into in the long term of the book. However, early on what we're going to be dealing with is Flash and Venom becoming an Agent of the Cosmos, which is set up when he gets cleansed. We know that when "Venom: Space Knight" picks up with the character eight months later Flash and his Klyntar pal will still be members of the Guardians of the Galaxy. Will their fellow Guardians have a role in this series? You might see them in little pops as we describe what I call Flash's "day job," but early on we really want to focus on Flash and the suit and their adventures. Also he's going to start to assemble his own cast of characters. Some of them will be allies. Some of them not so much. In classic space adventure fashion, in the first issue he's going to get his own ship. It's something he takes rather than borrows from a character we meet in the book. [Laughs] Part of what comes along with that ship is an android named 803. I pitched the character as, "Imagine if the rescue had gone horribly wrong and C-3PO had stayed with Jabba for thousands of years." So 803 is this self effacing somewhat suicidal android, and serves as an early sidekick in our initial stories. Ariel's design for that character is fantastic. As we go along on these new adventures, we're going to see Flash making new friends and new enemies. He'll be building more of a team around him. So long term you'll see a few pops of the Guardians, but initially we really want to focus on Flash and the Klyntar. What kind of reputation will Flash and the Klyntar have when you pick up eight months later? Will they still be judged by the symbiotes' reputation in the universe? Or will people have started to view them in a different light? It will mostly be the reputation of the suit, of the Klyntar, which is a known entity in the universe. Flash is going to be making a name for himself in these adventures. Eight months will have passed, but we'll be joining him on his first adventures out on his own. Basically, he's answering a call. He's not really sure who's calling, but he's answering. Then as these stories start to unfold, Flash will gain a bit of a reputation, and will not necessarily be the most popular person to certain people in the Marvel Galactic Universe. And while Flash and the Klynter are getting a chance to turn the page on their past, they're still Venom and Venom is a badass. Flash is also a person who doesn't mind stepping in when he thinks something has gone wrong. That's a great way to be a hero, but it's also a great way to make some enemies. Will Venom's new adventures take Flash and his Klyntar to frontier-style worlds? 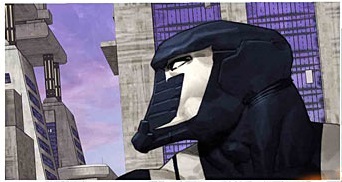 Or will they be visiting the urban centers of the Marvel Universe's major galactic cultures and empires? We're going to be focusing more on some outer rim and frontier style stories from the jump, but we'll be bringing in some familiar aspects of the Marvel Galactic Universe. For people familiar with this corner of the Marvel Universe, they're going to see some recognizable faces, foes, and allies. So "space opera" would be a fair way to characterize "Venom: Space Knight?" Yes, this is a space opera. Jake had such a great, strong take on where he wanted to see this book go, story and character wise. There are elements of Flash, pardon the pun, Gordon style space opera and there are also elements you're getting from our Flash who has a military background, bringing a spec ops military thriller style aspect to it all. But really it's just a big space opera and who better to draw that than Ariel Olivetti? Yeah, in my opinion he's at his best when draws big hulking heroes and strange alien worlds, and it seems like we're getting both in "Venom: Space Knight." Huge credit to Jake for getting Ariel on the book because he's literally the perfect artist for this and I cannot wait for people to see the pages he's done. His pages are so fantastic and they instantly transport you to other worlds. And for me as a writer knowing that I'm working with an artist that is that talented and loves to draw this kind of stuff it's very freeing. We've been trading e-mails back and forth asking things like, "How many tentacles?" And "How many bizarre worlds do you want in this issue?" [Laughs] Ariel sends me in fun directions all the time with his art. Like the promo image -- I wrote directly to that because it so perfectly captured the tone of the book Jake and I were talking about. You instantly get a sense of the style and tone from that teaser image and that's a credit to Ariel as a storyteller. It's been a great collaboration so far and, as I said, I'm really, really excited for people to see his work. It's big. It's bold and exciting, and it's everything you expect and more from Ariel. If you're a fan of Venom or Flash Thompson, like I am, I think you're really going to love this book. 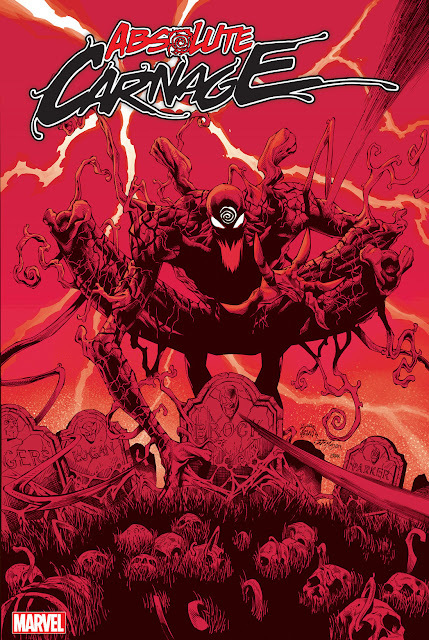 And if you're looking to catch up on Flash's exploits I highly recommend the "Planet of the Symbiotes" storyline that was in the most recent volume of "Guardians of the Galaxy." If you haven't checked that out it's a great read, but it's also our set up. We're picking up from where that story line left off. This is shaping up to be a very good Fall for Symbiote fans!! 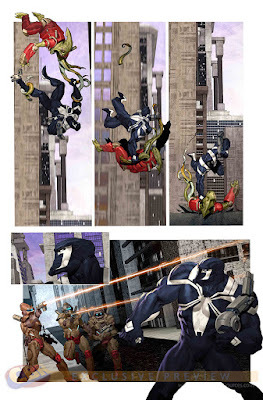 What do you think of Venom's new solo series?